In today’s intensely competitive marketplace, the business world is moving rapidly to online transactions from inefficient, costly, paper-based processes. Furthermore, consumers expect to be able to interact digitally anytime, anyplace, so providing easily accessible digital touchpoints is also critical to successfully keeping and retaining your customers. No matter the size or type of business you’re in, you want to save money and increase revenue. And you want to make it all easy. 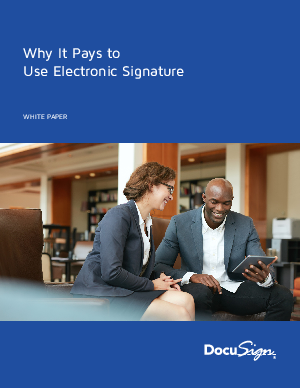 Electronic signatures are a powerful way to accomplish all that.